Trailing suction hopper dredgers deposit the dredged sand from the sea on land via rainbowing or through a pipeline. Infl uenced by wind and water the sand gradually spreads along the coast of South-Holland. This is called 'Building with Nature'. The Sand Motor will gradually change in shape and will eventually be fully incorporated in the dunes and the beach. The Netherlands’ system of dikes and sea gates has long been the best in the world. But as the country confronts the challenges of climate change, it is increasingly relying on techniques that mimic natural systems and harness nature’s power to hold back the sea. On a freezing winter day along the south-central coast of Holland, two beachcombers, hunched against the wind, stroll along a crescent of sand extending more than half a mile into the North Sea. Nearby, a snowkiter skims over the 28 million-cubic-yard heap of dredged sediment spreading along the shore. If all goes as planned, the mound will eventually disappear, rearranged by ocean currents into a 12-mile-long buffer protecting the coastline for the next two decades. Between March 2011 and October 2011, Rijkswaterstaat and the provincial authority of Zuid-Holland created the hook-shaped peninsula. It extends 1 km into the sea and is 2 km wide where it joins the shore." After having constructed the country’s vaunted system of sea gates and dikes, Dutch planners and engineers are now augmenting it with new technology enlisting nature to keep the water at bay. “Normally, there is a lot of erosion here,” says hydraulic engineer Mathijs van Ledden, sweeping an arm toward the snow-covered spit snaking around an elongated lagoon. Van Ledden is a flood risk reduction specialist with Royal HaskoningDHV, a Dutch engineering consultancy involved in creating the Sand Engine, currently 2.2 miles wide. “This big reservoir of sand should re-nourish the rest of the coast in time,” he says, gesturing toward the skyline of The Hague, several miles away. 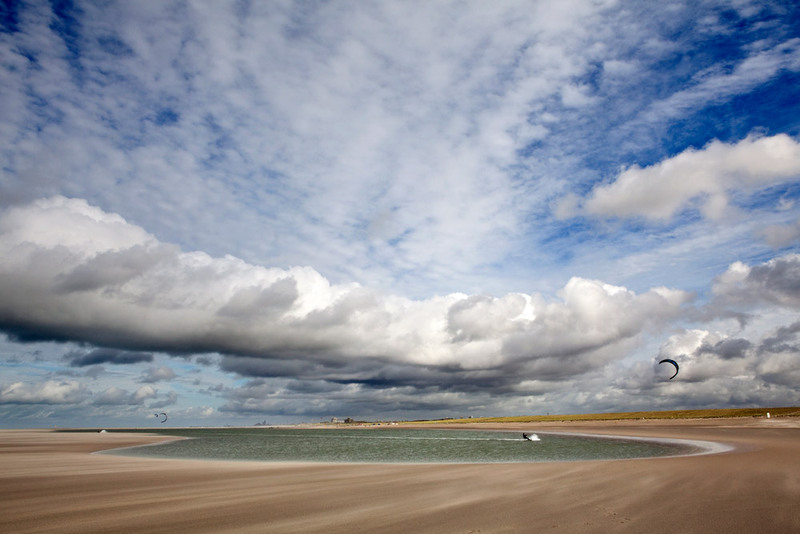 In 2011, a Dutch ship pumps material onto The Netherlands' so-called Sand Engine project, a 28 million-cubic-yard heap of sand along the coast of Holland that will be rearranged by ocean currents and fortify a 12-mile buffer to protect the coastline. The Sand Engine is the signature project of Building with Nature, a consortium of Dutch industries, universities, research institutes, and public water agencies looking to harness natural systems for next-generation hydraulic engineering. Completed in late 2011 at a cost of 50 million euros ($67 million), the Sand Engine’s goal is to provide long-term fortification for eroding beaches as ocean currents gradually redistribute its dredged material. Until now, this coastline needed sand replenishment every five years, requiring expensive dredging that damaged marine ecosystems. The Sand Engine will feed beaches for about 20 years at half the price, said Marcel Stive, chair of coastal engineering at Delft University of Technology (TU Delft) and principal creator of the technology. “At this moment, this is the safest coast we have,” Stive said. The Sand Engine, as seen in 2012. The project is part of "Building with Nature," a consortium of Dutch industries, universities, research institutes, and public water agencies that is seeking to mimic natural systems and harness nature's power to hold back rising seas. With sea levels climbing — many coastal experts are projecting rises of 3 to 5 feet this century — and climate change expected to boost storm frequency and intensity, flood protection is an increasingly pressing issue worldwide. And at the forefront of flood-control technology are the Dutch, long aware of the damage that surging oceans and overflowing rivers can wreak in their low-lying country. Hydraulic engineering has been underway here since the Middle Ages, and the country’s 16.7 million residents have “dry feet” thanks to a network of dikes, canals, and engineering marvels like the Maeslant Barrier near Rotterdam: two floating gates, each the length of the Eiffel Tower, that automatically close to shield the city and its major port when a North Sea storm surge threatens. Managing water is big business in The Netherlands: Dutch hydraulic engineers and related industries brought in around 7.5 billion euros ($10 billion) in 2008 from projects around the world, according to the most recent figures available from the Netherlands Water Partnership. But while the Dutch export their high-tech engineering prowess worldwide — designing gigantic, mechanical structures like London’s Thames Barrier — at home the future of flood-defense encompasses a return to basics: utilizing natural materials, mimicking natural systems, and harnessing nature’s power to protect this vulnerable nation. A so-called "Smart Dike," which contains embedded sensors that relay real-time status reports on the condition of the dike to decision makers. Early notice of a developing problem could give officials time to make repairs or enable residents to evacuate in advance. Projects like the Sand Engine illustrate the potential and challenges in flood-risk management, said Jos Maccabiani, a geotechnical engineer with the nonprofit applied research institute, Deltares, and program secretary of Flood Control 2015, a national initiative to improve flood management. In addition to being cost-effective, new infrastructure must minimize environmental impacts and be adaptable to changing climate conditions. One solution is employing living organisms as natural buffers. De Vries, an eco-engineering expert, is designing hybrid dikes, planting vegetation such as willows on the seaward side to absorb the ocean’s first blows. The dike itself can then be lower, less expensive, and more durable than a traditional dike. De Vries estimates it cuts costs around 30 percent. Nature is also being recruited to turn existing dikes into ecologically enhanced “rich levees” that mimic rocky coasts, providing habitat for marine organisms. Adding roughness to the dike’s seaward face dampens waves and reduces overtopping, said Jasper Fiselier, an environmental planner with Royal HaskoningDHV and a Building with Nature project leader. To give nature a helping hand, Dutch researchers are working on new dike materials like flexible cement to attach energy-absorbing stones, geotextiles that prevent internal erosion — a major cause of breaches — and super-strong grass that dampens wave action. One intriguing process strengthens dikes with “bio grout” produced by bacteria fed a substance that makes them excrete calcium. So far, it only works on a small scale. The new designs provide a longer-term solution than barriers, proponents say. “If I make a [concrete] dike, and conditions change, I have to re-do the whole dike,” Fiselier said. The Netherlands is now considering a host of eco-engineered structures in a proposed 1 billion euro ($1.34 billion) package of flood-protection upgrades. Several are already in the works, including replacing the country’s tallest dike, near Hondsbossche, with a sand dune, and shoring up an aging dam in the eastern delta with a small sand engine. The country’s first hybrid dike is now being built near Dordrecht. Incoming waves will lose power in a flooded willow forest before they reach the dike. “The dike is going to be much softer and lower, because you get the waves out,” de Vries said. Other countries, including Singapore and Vietnam, have expressed interest in the new designs, according to de Vries. Building with nature is a special challenge in urban areas, said Matthijs Kok, a flood-risk professor at TU Delft and a member of the environmental consulting firm HKV Consultants. His solution is multifunctional levees, which combine ecological, recreational, and economic functions with flood control. To satisfy the various interests, businesses such as restaurants and hotels, public facilities like swimming beaches and hiking paths, and natural areas are being integrated into flood-control projects. One such example, now under construction at the seaside resort of Scheveningen, is a new dike protected by a widened beach and concealed beneath an undulating pedestrian- and bicycle-friendly esplanade. But using nature to fight floods is not a panacea. Dunes and plants take up more room than traditional dikes. Moreover, faced with the larger storms and swollen seas predicted for the future, natural defenses may not always have enough muscle. “Let’s be honest about it,” said van Ledden. In addition to bolstering flood defenses with enhanced natural systems, Dutch scientists and engineers also are working to “improve the decision-making when things might go wrong,” said Maccabiani. To that end, Deltares is developing Smart Dikes — sensor-embedded levees that relay real-time status reports via cell towers to decision-makers. The purpose is to give “more time to react when you see something inside the dike that is happening while you don’t see anything on the outside yet,” Maccabiani said. Early notice of a developing problem could give time for repairs or let residents evacuate well in advance. Another high-tech project underway at Deltares is 3DI, which uses LIDAR, a three-dimensional laser imaging system, to map out underground water-storage capacity. The system, projected for rollout in 2014, will pinpoint flood-prone spots and places where excess water, such as runoff from heavy rains, can be accommodated. Many areas of the U.S., including the coasts of Southern California, Florida, and New Jersey, would also benefit from natural or soft defenses, according to de Vries and others. But so far, the new designs have gotten little attention across the Atlantic. American engineers are “very much into building dikes and hard structures,” de Vries said. The new Dutch technology has promise, and flood management agencies in the U.S. are keeping an eye on it, said Jason Needham, a consequence specialist with the U.S. Army Corps of Engineers’ Risk-management Center in Davis, Calif., who recently spent a year in the Netherlands on a staff-exchange program. But sophisticated devices like Smart Dikes are expensive, and haven’t yet proven their worth, he said. The two countries have different approaches to flood control, Needham acknowledged, with the Dutch focusing mainly on prevention, while Americans emphasize emergency preparedness and recovery. In the face of an uncertain future climate, however, the objectives are now converging.